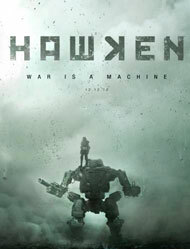 Strategy is important, too, since the team-based combat of Hawken is objective-centric. In the game I played, my team was tasked with gaining control of an anti-air cannon so that we could bring down the enemy team's battleship, bombarding us from the sky where it hung, drifting across the map. It was even possible to shoot it with one's personal weapons, but this was a quick way to draw its attention and wind up curb-stomped by its powerful artillery. There are standard team and free-for-all deathmatch modes, but this "siege" gameplay feels like the bread and butter of the game. There were, however, elements that could stand to be improved. 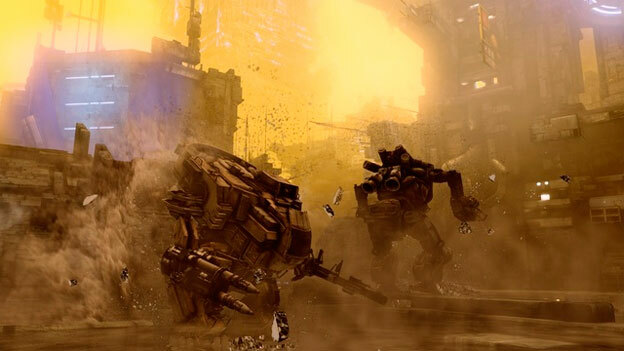 While Hawken is a good looking game, its color palette is fairly bland. Everything is somewhere on the scale between gray and black, with only occasional flashes of a neon sea green. It's an appropriate aesthetic for a futuristic mech game, but I can't help remembering that the Mechwarrior titles were able to work with reds, browns, greens and blues in equal measure. Hawken is a more urban game, with the battles taking place in city environments, but that doesn't mean everything should look washed out. More importantly, there isn't really any indication that one is low on health. There's an explicit health meter, yes, but there are no effects to indicate that it has dipped into the danger zone. Flashing red lights or a cockpit fire, perhaps? Occasionally, there's a bit of a static effect overlaying the screen, but this seemed inconsistent at best, and didn't really draw one's attention immediately, which led to a few careless charges into hopeless combat situations. Folly should come from the player, not the game. As a free-to-play title, there's a certain amount of slack one must cut such a game, but given that the Hawken devs felt confident enough to commission a controller that may retail for as much as $250, it's hard to overlook a lack of polish in any element of the game. That said, it was a lot of fun to play, and gave me thrills in much the same way older mech games provided. It's also still a good six months out, so there's time yet to address the few complaints I can levy against the title. Battle against other players in a rich multiplayer experience. Optimize your hardware with a robust system allowing the player to focus on the abilities that matter to them - Offense, Defense, or Agility. Fill your mech hanger with powerful creations. Each mech can truly be something unique by customizing its parts, abilities, performance, and visual style to suit how you like to play.